Here we have another wonderful example of how a coat of paint can make such a difference to the way almost anything can appear. MYA 590 is a Leyland Comet CPP1 with Harrington C29F body. In the first view, it is in the livery of Scarlet Coaches of Minehead, and it is in the Southsea rally on 17 June 1984. In this second view, it has been repainted blue and cream to star alongside Joan Hickson in the ‘Miss Marple’ film, Nemesis. This view was captured at Netley on 12 July 1987. 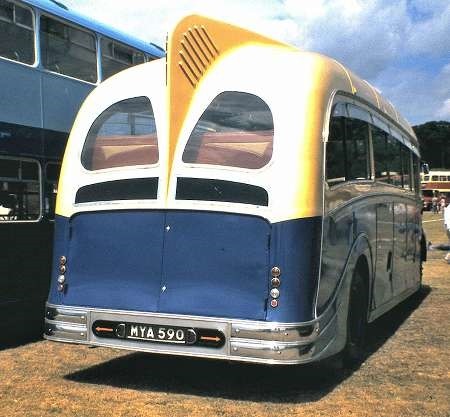 I seem to remember that, during the 1950s, the livery change between the top colour and the lower was achieved by a ‘blend’ of the two colours down the rear corner panels. This was fashionable at the time, although must have been incredibly difficult to achieve. Virtually impossible to achieve with brush painting, so presumably the gradual change from the light colour to the dark might have been a way of showing off the ‘new spray painting’ technique. It’s not a feature I have seen on any currently preserved coaches, but this picture of the unnatural hard line between the two colours has sparked the memory of this old style. Can anyone suggest why, given Leyland’s good name, the Comet was not more popular? Did the Tiger Cub sweep it away? The Comet wasn’t in the same market as the underfloor-engined chassis. 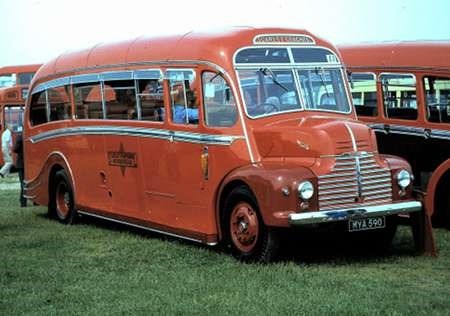 As a lightweight with a seating capacity probably limited to 32, it was competing with the Bedford OB and Albion Victor. It’s likely to have been more expensive than both, and didn’t really offer anything extra. Later passenger variants of the Comet were forward control but aimed primarily for export. There was a Duple bodied ECPO12/2T in preservation once, this was one of a handful sold on the home market, the Albion Victor and the SB, particularly with a Leyland Engine, not to mention the Ford and Commer alternatives made it a non-starter over here although it was very popular in New Zealand with the Bedford SB8 and SB13 known as the "Poor Man’s Comet". With regard to the piece by Roger Cox, a photo showing Comet OPB 536 next to Wimbledon Coaches or Allco’s RF 266 (MLL 803) taken at Cobham Bus Museum has recently appeared on my son Simon’s Facebook page, but I can find no further mention of it in preservation, unless anyone knows better! Thanks for the picture of MYA 590. It used to be parked in the open near the sea front in Minehead between tours, and must have been the best polished commercial vehicle I have ever seen. You could always see your face in it. The owner must have spent every night polishing, because I never saw any work being done on it during the day. Glad it ended up making popular films – it really deserved to be seen, even if in different livery. Scarlets was a small company with usually only one bus – as far as I know, except when one was replaced and they ran two – perhaps just for a summer season. My brother suggests that in 1982-83 the Royal Veterinary College used a Scarlet bus which sounds very like MYA 590 to transport a student running team to Holland (in both years). Sorry to go on, but your page has got me going. I have been reminded that Scarlet Pimpernel of Minehead and Blue coaches of Porlock (both with a single vehicle, it seems) merged in 1954, and continued until about 1970. Both Vehicles are now in Coventry, MYA 590 in Pimpernel livery and its stable mate (JYC 855) in Scarlet and Blue. (latest picture/record I have found is 2017 (of JYC)) With a 20 year career of summer day tripping over Exmoor (including the famous Countisbury Hill into Lynmouth) and winter theatre trips to Bristol, Bath and Western Super Mare etc, shows the quality of these vehicles especially as there was no back up if one broke down.They still seem to make regular trips down to the London Bus Museums open day at Brooklands in April, possibly under their own steam? It is just JYC that is based in Coventry MYA being in Surrey I think. There is another Scarlet Motors Harrington on an AEC chassis complete in Bromsgrove but the owner has not taken it out for several years. 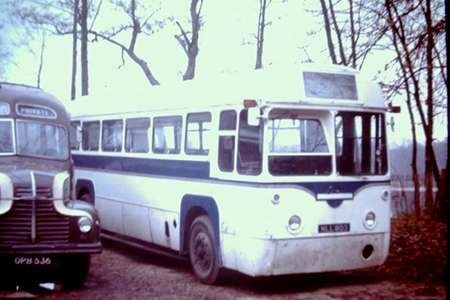 There is a Blue Motors Harrington Bodied Cheetah based in Sussex. MYA+JYC last got together in 2015 or 2016 at Brooklands in their Harrington/Weymann anniversary get together. JYC is on the road every two years and 2018 is an on the road year. Only confirmed appearance is in the Oct Isle of Wight Beer & Buses Weekend. I have a few photos of the AEC Roger when for a short period it was owned by Howard Homer. Unfortunately the lighting wasn’t very good as it was undercover, this would have been in the 90s.